There's a new Senate in town and bills are already getting shot down. In other news, protestors in Hong Kong are somberly starting to pack it in, and here in Erie we honor one of our many fine educators. You're halfway through the week. Stay strong. 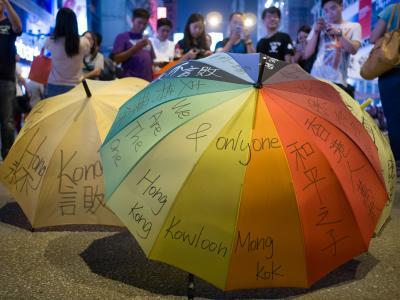 The past couple of months have seen the dramatic rise of pro-democracy student protests in China, the most notable of which taking place in Hong Kong where demonstrators have effectively set up tent communities. Unfortunately, all that seems to be coming to an end, and with not much to show for it as the Chinese government has done little to address protester's complaints. After a couple erratic bursts of violent demonstrations, authorities have began to crack down hard on all fronts, forcing retreat. No sooner does the U.S. Senate see a major partisan shift than do we start to see the result reflected in legislative decisions. The USA Freedom act, despite receiving support from both sides of the aisle, ultimately failed to secure enough votes to cut off debate. With issues of regulating NSA surveillance still on the table in our nation's capital, it's difficult for many not to question the extent of their privacy. Tuesday, the Keystone XL pipeline project which would aim to expand an oil pipeline running from Canada to the Gulf of Mexico, has failed the approval of both Congress and the Senate. Throughout the prior deliberation, democrats and republicans rallied back and forth over the potential pros and cons of the project, and President Obama allegedly stopped short of saying he would outright veto the bill. Given U.S. continued involvement in global climate change talks over the past months, it is easy to see why the President would be hesitant to let such a bill pass. A suicidal Pittsburgh man who blew up his house on Oct. 12 2013 was sentenced to ten years in prison this past Tuesday, after pleading guilty to over a dozen separate charges related to the blast. Several homes were severely damaged by the explosion, and suspect Shawn Landa immediately pleaded guilty to all charges after recovering from his injuries. Becky Powierza, a sixth-grade teacher at Diehl Elementary School, has already received several recognitions for her outstanding work with low-income youth prepare to succeed in college, and most recently Powierza was honored by College For Every Student for her continued success. Powierza stands out as an example of the often overlooked, but always appreciated efforts of educators in the Greater Erie Area.